Check Your Thinking: So now that you know quite a bit about ice, snow, and water, can you explain how snow and ice help to regulate global climate? The atmosphere, water, snow, and ice work together to help keep the global temperature within a range that will support life. More importantly, these factors keep temperatures fairly constant from year to year, thus preventing abrupt changes in local climates. Abrupt changes in local climate (which can cause events such as severe, prolonged drought) cause shifts in what food crops can grow, and what vegetation is available for food for animals. Abrupt changes in local climate can cause animal populations to die out, if they are unable to move to more favorable locations, and seriously impact human populations, forcing populations to either move or die from starvation. Conductive heat flow through snow and ice provides data about global climate change. 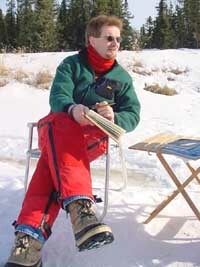 A wide variety of types of scientists study snow and ice and its relationship to climate. Figure 5.24: Dr. Martin Jeffries. The scientists involved with the development of this snow study module are Dr. Martin Jeffries, Ms. Kim Morris, and Dr. Delena Norris-Tull. Dr. Martin Jeffries: A research scientist with the University of Alaska Fairbanks Geophysical Institute, currently serving as Project Director for the National Science Foundation’s Arctic Observing Network. Dr. Jeffries studies sea ice, ice shelves, and icebergs in the Arctic and Antarctic, and studies lake ice in Alaska. 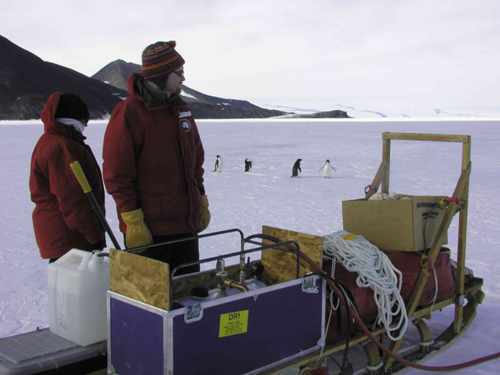 In 2002, Dr. Jeffries and his colleague, Dr. Derek Mueller, documented the breakup of the Ward Hunt ice shelf, an Arctic ice shelf off the coast of Ellsemere Island. For details of that event, refer to The Splitting of the North’s Largest Ice Shelf article from the Alaska Science Forum. Ms. Kim Morris: Research scientist with the University of Alaska Fairbanks Geophysical Institute, conducts research on sea ice and lake ice. She currently is writing science curriculum for K-12 schools through the GLOBE project. Figure 5.24: Kim Morris and Dr. Martin Jeffries. Dr. Delena Norris-Tull: A science educator, formerly with the University of Alaska Fairbanks. Delena is now a professor at the University of Montana Western, teaching both education and science courses. She is also a botanist who has written two field guides to wild plants of Texas, under the name Delena Tull. These three individual have worked together since 2001, helping teachers understand the science of snow and its relationship to climate. Along with now-retired middle school science teacher, Ron Reihl, they developed the Alaska Lake Ice and Snow Observatory Network, a project that engages teachers and their students in studying ice and snow on lakes and ponds throughout Alaska. For further information about the Alaska Lake Ice and Snow Observatory Network (ALISON), visit the ALISON website. Abbott, C., & Swanson, M. (April/May 2006). A rewarding partnership: Critical components of a successful scientist-student partnership. The Science Teacher. National Science Teachers Association, Washington, D.C.
Jeffries, M.O., Gallego, P., DeBlauw, D., Morris, K., Norris-Tull, D. (Dec 2006). Lake ice and snow study in Denali National Park and Preserve promotes elementary school science education. Alaska Park Science, 5 (2), 18-23. Jeffries, M. O. and K. Morris. 2006. Instantaneous daytime conductive heat flow through snow on lake ice in Alaska. Hydrological Processes, 803-815. Jeffries, M. O., K. Morris and C. R. Duguay. 2005. Lake ice growth and decay in central Alaska: observations and computer simulations compared. Annals of Glaciology, 40, 113-118.